This Swiss 7.5x55mm ammunition, manufactured by defense conglomerate RUAG, delivers the superb accuracy the cartridge is known for at a reasonable cost. These rounds, packaged in a case of 48 boxes of 10 rounds each (480 rounds total), use a 174 grain full metal jacket bullet and follow the GP11 standard. Although the cases are reloadable brass, these rounds use non-corrosive Berdan primers, which will require different reloading equipment. 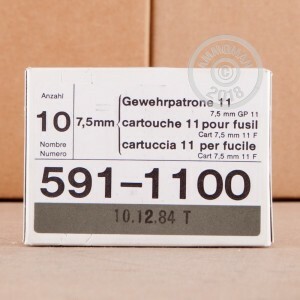 Introduced in 1911, GP11 ammunition in the 7.5x55 Swiss cartridge served as the standard rifle round of the Swiss army for many years and continues to see use in machine guns and sniper rifles as well as civilian sport shooting. 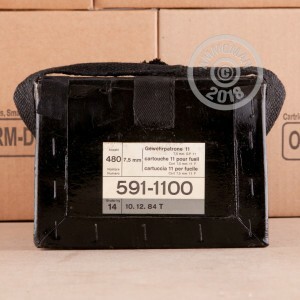 Buy this case of ammunition, or any other items at AmmoMan.com totaling over $99, and receive FREE shipping. Simply the best surplus ammo in any caliber. It rivals the best, current production American and German ammo. Wonderfully and uniquely packaged. Every Swiss shooter should have one or two boxes of this stuff on the shelf. And shipped by Ammoman for free clear across the country to me in the Northwest. Thank you. This stuff is so good, I wish our domestic and military surplus were the same quality. Finest milsurp ammo ever made. Needlessly repainting steel targets that are set at 100 to 600 yards because the paint keeps getting blown off with this stuff. Would recommend buying less accurate ammo to avoid target maintenance. Awesome ammo! Great price and super fast shipping! This milsurp ammo is great! Thanks again! This milsurp ammo is the best! You guys shipped it fast and at a great price! I'll definitely be purchasing from you in the future! Ammo arrived on time despite bad weather and the Christmas season. The ammo came in its original box with the Swiss seal from the factory still intact. Despite being manufactured in 1982, the rounds look as though they are new production and their accuracy is match grade. Hopefully I can purchase another case in the future. Arrived when it was supposed to, great shape, no issues with ammo or supplier, great price, thanks!! I searched around and believe me you won't find a better deal. Every one that has this to offer charges any were from $20-$40 in shipping alone. Insane. A couple of friends and myself went through about 60 rounds. They performed perfectly. Will definently be buying more before i run out. Amazing match grade ammo for your K31. Great deal from Ammoman. Excellent ammo at an awesome price! Can't beat free shipping on a full case, that would have cost $35 from any other dealer, beautiful ammo and great customer service, what's there not to like!! I'll buy another case soon. 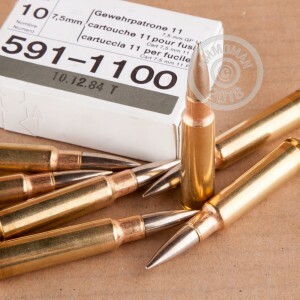 GP11 ammo is the best you can get for your K31 rifle and ammoman.com has the best full case price. I enjoy using this ammo for my long range shooting events. I own a K31. I purchased this ammunition because of it's outstanding reputation with regard to accuracy. I have fired 100 rds. now. The accuracy is just magnificent. I an 67 years old, shooting from the bench my K31 prints 1 1/2"- 1 3/4" groups. The ammunition is as clean as the day it was made. It's non-corrosive, clean firing, and accurate. I am one happy customer. Thank you AMMOMAN! GP11 speaks for itself and has been hard to find before this recent batch. Price is right, shipping is free, can't go wrong with ammoman! very consistant ammo. 1000+ rounds in and no case issues or misfires. The small 10 count cardboard boxes are great for packing up for the range. I would recommend to anyone! This GP11 ammo is superb. It is very high quality and is match grade accurate. The packaging is very robust and the 10 round boxes are just right for the range. I would recommend this ammo to everyone.